1) I'm outlining the rest of the series, or at least the rest of the series involving the main characters as they stand now. This will give me a clear picture of where it's going and it will enable me to write a synopsis of each book. 2)Using the bird's eye view of the series from Step 1, write a pitch for the whole series with which to query agents. I believe that this series could be very commercial. I also believe it will fit nicely into the newly minted "New Adult" category that seemsso popular right now. It has enough of contemporary fantasy aspects to appeal to a young audience, but the characters and subject matter are definitely more mature than Young Adult. Imagine a Twilight style love triangle (no vampires or werewolves, I promise) with DaVinci Code style themes and you're coming pretty close. 3)Query, query query while working on my platform and trying to build an audience. That will likely include a trailer or two that I already have worked out in my head. Luckily I know a good filmmaker, my brother, who I might get to help me with that. 4) Write, write, write the second book. Hopefully, this one won't take more than a decade to write. But the writing/editing of it will most likely determine the timeline of the rest of the plan. I'll keep querying until I get a bite or finish the second book. If no agents or publishers have bitten (I really promise there are no vampires in this series. ), then I will likely publish them myself in close succession. That way I can hopefully whet the reader's appetites with the first two books enough to get them to buy a third and fourth, fifth, and who knows by then I might even plan a series for the next generation of characters. At least that's my plan, and it feels pretty darn good to start off the new year with a plan. Now for some details about the first book. 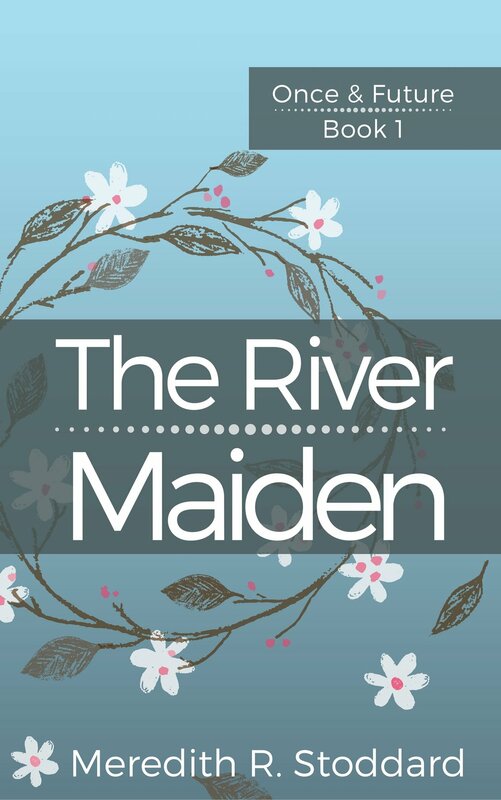 The working title right now is THE RIVER MAIDEN. Here's a working cover. Raised by her Scottish Grandmother in the Blue Ridge Mountains, Sarah MacAlpin grew up with one foot in the old world and one foot in the new world. She's worked hard to get to where she is and at 25 she's got her life planned out, that is until she meets Dermot Sinclair. Plagued by nightmares of a tragic past and murky visions of the future Sarah pushes on toward finishing her dissertation. In spite of her hard work and planning the world around her seems to be spinning out of control. Her relationships with her boyfriend and her best friend are falling apart and the new guy in town seems to be dogging her every step. He's friendly enough and can help with her research, but she can't help thinking there's something that he isn't telling her. If you're interested in reading further. There is a large chunk of the book available to read on Authonomy. If you read it there, please leave feedback. It will only help me. If you're interested in being a beta reader (kind of like a beta tester for software) and getting to read the whole thing once the edits are done (naturally in exchange for your feedback), please let me know in the comments here or through my Facebook page. I hope you all will have as exciting a new year as I expect to. I can't count the number of writers that I've heard in various forums saying that they just sit down and write and "let the story take me where it will" or something like that. These people often say that they don't know how a story will end when they start writing. Now, I'm not one to cast aspersions on anyone's process. I say do what works for you, as long as it's actually WORKING. I however, have never been one to just sit and write with no end in mind, at least not for anything longer than a blog post. That method might work for poetry, flash fiction or even short stories, but anything longer than a few printed pages and I better have an outline. This could be the fault of my high school English teacher, Rita Mullins. Aside from Mrs. Mullins many gems of literary wisdom, one of the things that she taught us that I have used the most, is how to create and work from an outline. I don't want to brag (Yes, I do.) but as a corporate trainer, I never missed a deadline for writing training material. That was entirely due to this habit of working from an outline. Where other trainers who weren't natural writers would sit and stare at blank screens trying to come up with a plan, I would schedule a plan allowing a specific amount of time for researching, brainstorming, outlining, writing and editing and I would work that plan. Voila! Training class on time with minimal stress. 1) Direction: Novel writing isn't a simple as writing training manuals. Sometimes I just feel a scene and it's better to write that when I'm feeling it or it might lose its emotional punch. But if I don't want to lose my way writing from point A to point Z then an outline is a necessity. There is always room for switching items around, changing order and scrapping scenes altogether. That's why I tend to do my outline on index cards, and nerdily color code them according to plot or sub-plot. For a large project like a novel, it's a way to get a bird's eye view of the whole story. Plus it's reminder of what needs to be written next. That doesn't mean that I write scenes in order. If I'm feeling one scene I might work on that. Likewise, if I'm not feeling one, then I can check what else needs to be written and try one of those. 2) Plot Check: Working without an outline is a bit like driving on back country roads with no map or GPS. It might be a lot of fun, in fact that's one of my favorite pastimes, but unless I have some set destination in mind, I'm likely to meander about with no direction take forever to get where I'm going. A book is not like that. If you meander about too much you risk losing the reader's interest. Lengthy passages about the beauty of barns on the back roads of central Virginia might be fun for me to write, but they're not going to turn pages. Every scene should move the plot forward, and using an outline helps me make sure of that. I can ask myself if an item in my outline moves the plot forward and if it doesn't, I can chuck it. Likewise, I can ask myself if anything is missing. Do the events in my outline motivate my characters to do what they are supposed to do? If not, what else do I need? 3)Accomplishment: There's a reason why I don't knit blankets or sweaters. It's not that I don't like them, I just don't like big projects like that. I get impatient and want to move on to the next thing. I actually get a little depressed if I don't have that sense of accomplishment that comes with finishing something every now and then. So, a big writing project like a novel or (gasp!) a series of novels can be a daunting task. Working from an outline helps me break that down to smaller more manageable tasks. I go act by act, scene by scene and check them off as I finish drafting each one. I even go so far as to print them out and put them into a notebook in the order of my outline right behind the relevant index card or cards for that scene. This way I can look at the manuscript and feel like I'm moving forward. As I said before, I'm not disparaging anyone's process or lack thereof. I'm just saying that the old adage "Fail to plan, plan to fail" is famous for a reason. It takes a remarkably rare talent to just sit down and write a book without knowing the direction or having the end in mind. So if you're a writer, you might ask yourself. Am I that rare creative genius that can do that, or am I a classically trained samurai?